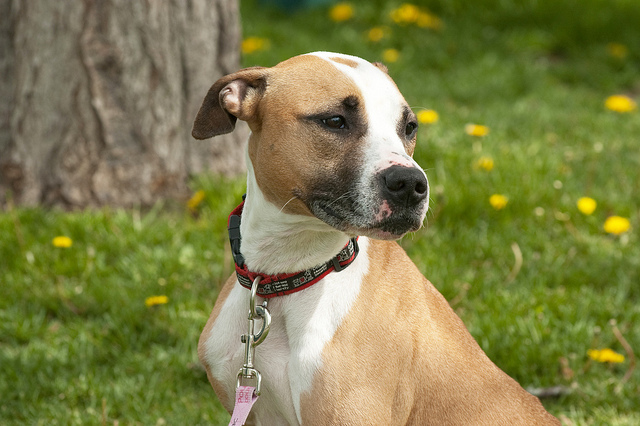 Ottawa Humane Society: Twiggy: a very special dog! You may have seen this sweet dog on our website over the past few months. Twiggy, a sweet and very gentle tan and white Pitbull mix, arrived at the Ottawa Humane Society on April 4, 2010. She has been staying at a foster volunteer’s home while we look for a home for her. • She wears a muzzle (preferably a comfortable cage muzzle, see www.ottawahumane.ca/your-pets/muzzle.cfm) when in public. • Lives in a home with a fully fenced-in back yard. Twiggy deserves a second chance. Below is the full write-up on her behaviour and her needs. If you think you’re the perfect match for this tail-wagger, contact the OHS at 613-725-3166 ext. 258 or at adoptions@ottawahumane.ca. Twiggy is a super wiggly and social girly! An owner with previous dog experience (breed experience is an asset) is recommended for this pooch, someone who will be a firm, but fair leader and give her the training and structure she needs. 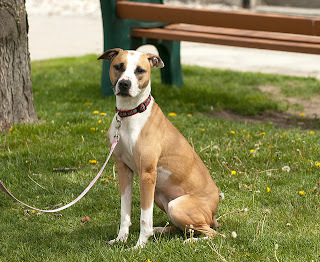 Twiggy is familiar with obedience basics but she could use a refresher. Obedience classes are an excellent place to socialize with people and other dogs as well as create and solidify the bond between her and her new owners. She is required to be enrolled in obedience classes in order to complete her adoption. She is very clever and learns quickly. She is an extremely friendly girl who shows her affection for people by jumping up and licking their face. She will need an owner who will teach her to be polite in her approach and to keep all four paws on the ground when meeting people. She LOVES toys especially the tennis ball and rope toy! She sometimes can get a bit carried away with her toys, but responds well when told to leave it. Twiggy is ideally suited to living in a home where there is space to move around, an active home with a fully fenced in yard where she will get all the exercise and stimulation she needs. A property check will need to be done before the completion of her adoption. Older, dog-familiar children would be the ideal match for Twiggy. She tends to jump up when greeting people, so kids who are sturdy on their feet and not easily intimidated by her boisterous personality would be best. Her foster parent did note that she was well behaved around young children, so children who are used to dogs and can help in her exercise needs may be just fine. 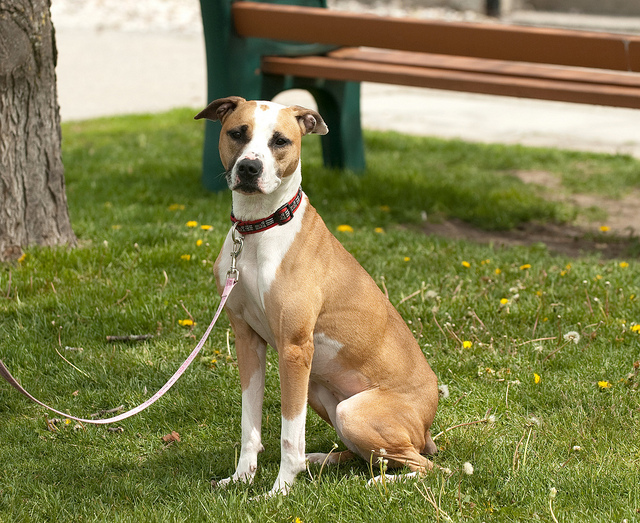 Note that a training collar (like a gentle leader or Halti) is recommended to teach her how to politely walk on a leash. She was tolerant of another female dog during her evaluation, but she is not a fan of overly intrusive male dogs. Ongoing socialization and positive interactions with other dogs is needed in order for her to learn appropriate meet-and-greet behaviours. She would most likely do best being the only dog in the household. She is curious of cats and may chase them so a cat free home is ideal. Twiggy has been well behaved and quiet in her foster home. She doesn’t bark or whine when left alone. Her foster parent notes that she is fully house-trained and has become quite well mannered in a short period of time. Crating is suggested for structure and a smooth transition into a new home. If you think you’re the perfect match for this tail-wagger, contact the OHS at 613-725-3166 ext. 258 or at adoptions@ottawahumane.ca.